How well do you know your quantum dots? Those that behave well in solution may act differently in living cells. Researchers at Fudan University in Shanghai, China, examined thiol-capped CdTe quantum dots in mouse myoblast cells and human primary liver cancer cells. The quantum dots’ optical properties in these cells differed dramatically when compared with their behavior in solution. 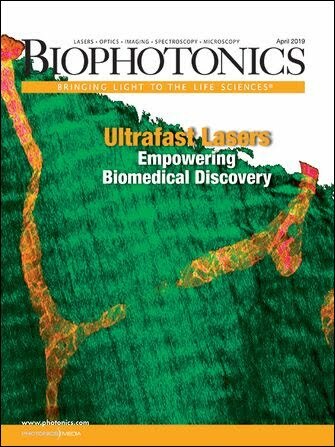 The investigators employed a laser-scanning confocal microscope from Olympus and a 405-nm semiconductor laser from Coherent as the excitation source. They directed the beam through a 60x objective onto an area approximately 1 μm in diameter. This image shows quantum dots in a mouse myoblast cell. They exhibited a blueshift upon excitation with a 405-nmsemiconductor laser. Based on the resulting images, they chose points at which they measured microphotoluminescence spectra. To make those measurements, they used the bundled microscope software to focus the laser on a fixed point, and they adjusted their system to an excitation power density of about 250 W/cm2. They focused the photoluminescence output from the side exit of the microscope on the entrance slit of a spectrometer with a nitrogen-cooled CCD, both from PI/Acton of Trenton, N.J. Upon continuous excitation, the quantum dots exhibited an initial peak wavelength of 602 nm and gradually shifted to shorter wavelengths. After 15 minutes of excitation, they had manifested a 35-nm blueshift immediately before they were entirely photobleached. The photoluminescence increased within 10 seconds and subsequently decreased, as reported in the Oct. 4 online publication of the Journal of the American Chemical Society. The researchers performed additional tests that demonstrated that the blueshift was caused by singlet-state oxygen molecules that formed on the quantum dots’ core surface. They said that might be interesting to investigators who study singlet-state oxygen, which can cause oxidative damage and is the active chemical in photodynamic therapy.